Growing up in Kansas City, there was an upscale grocery store by the name of Wolferman's. One store was downtown and the other on the Plaza. They had a wonderful bakery section which the best cookies and they sold many of their "private brand" products -- my most favorite was their English muffins. And when I was young and single and in my first apartment I bought three boxes (for that' what they came in then) for $1!!!! Wolferman's muffins were unlike any other. First they are really tall and they come 4 to a package not six -- but the package is the same height as a "six pack" -- they're just big muffins! Wolferman's, the store, closed ages ago but they kept the bakery and kept making muffins. It was sold to Sara Lee and then Williams Chili (another local KC company) bought it and then it was sold again, to Harry and David. There are Wolferman Muffin fans all over the country and they do a good business in muffins. When I was young there was just one variety which is now known as the 1910 Original. Now they come in everything from blueberry to jalapeno. Me -- I'm a purist preferring the 1910 Original but, if I can't find them, I'll survive on the sourdough! And how happy I was last week to find packages of Wolferman muffins at Costco!!! Of course, I had to get some!!! 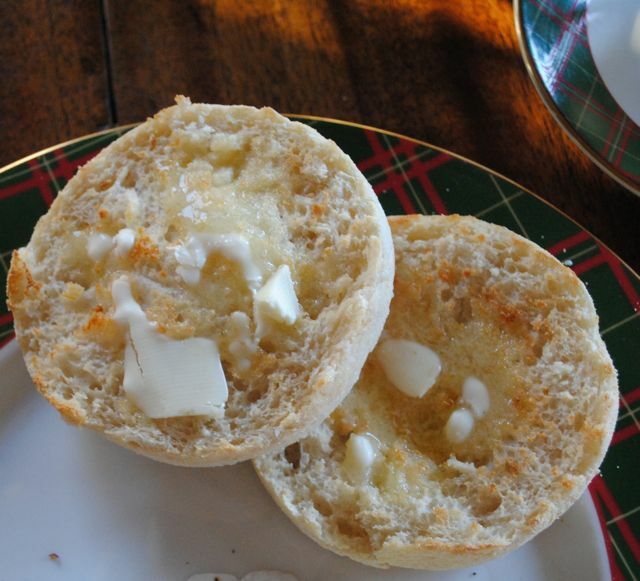 They also make crumpets -- real crumpets which are perfect for tea -- but alas, you have to order those!!! But it is always nice to have some in the freezer in case unexpected company stops for tea. 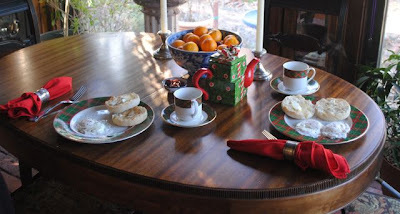 It's Advent and so, the Christmas china is utilized for any meal that doesn't involve soup!!! I don't mind washing two plates, cups and saucers by hand! The napkins, too, are now red in honor of Christmas. The pattern is Royal Doulton Tartan which I bought on a trip to England and hand carried home eons ago! 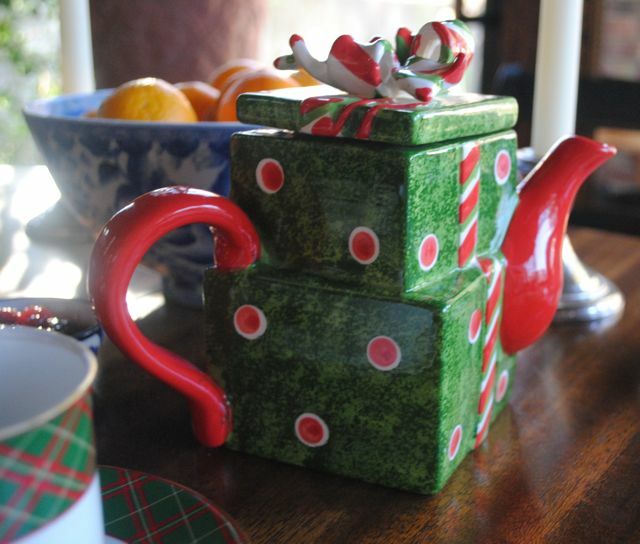 The teapot is also Christmas, it's new, and was a birthday gift from my dear friend Shirley Ann. They are pre-forked split which means that the muffins themselves are full of nooks and crannies which are so good for the butter to melt into. Sometimes, jam is in order but mostly I am a purist preferring butter only!!!! It's Tuesday which means that it is time for tea, so please join these ladies for Tuesday teas. I am off to Costco tomorrow! I hope those Wolferman's muffins made it to our neck of the woods. I have the marmalade standing by! Thanks for the shopping tip. I like my English muffins dripping with butter and honey, and my crumpets with butter and strawberry jam. 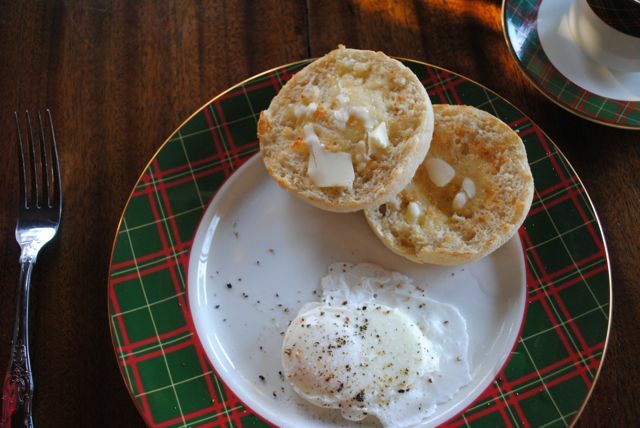 I love a good English muffin! And I'd love a set of those tartan plates. ;-) Who makes the plates? Oh I do love eggs, toast and tea! Your tea cup is very pretty. And your food makes me hungry! Martha, Growing up in Kansas City, this post means so much and brings back many memories. I too can only eat a Wolferman's English Muffin. They are the best in the world! Do come and enter my giveaway from Fifi Flowers value at $200! Sarah -- the plates are by Royal Doulton -- they made three coordinating patterns in the mid 80's. They've since discontinued all 3 of them. I'm not even sure Royal Doulton makes Christmas china any more! 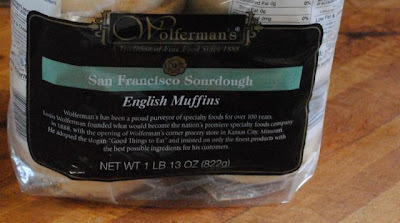 Pondy -- you can order the muffins by mail -- google Wolferman's English muffins and you can pull up a website. Once you taste a Wolferman's, it's hard to go back! Karena -- Wolferman's does bring back memories -- I liken it to the Kansas City Dean and Deluca! Oh yummy! I have never heard of Wolferman Muffins, but will look for them now. Tea with muffins or scones, I am so hungry now. It has been a while, but I used to order the muffins and crumpets regularly. I should give it a go again. I did not know the history so thank you for the information! Lovely table. Christmas dishes are so much fun and yes, for a couple of weeks taking extra time is part of the season...being mindful of the moment even if it is washing a pretty plate! Very cold over the state line this morning! I am up early with robe and tea cup! I'm a purist, too. Butter only on the toasted English muffins. I remember some of those places in the Kansas City area. We lived in KC, Kansas until I was 12. Wolferman's was one of my Mother's favorite places to purchase English Muffins and a special Christmas bread!Ah~h the memories! Today is definiately a Tea Day! Thank you for dropping by and joining our tea this week. A wonderful post! Love the tartan plates with the polka dot teapot. The muffins sound so very special. I will be looking at Costco...hopefully they have made it this far north. These look wonderful and on your rec. I will have to look for them. I need to make a Costco run soon so I will look for them but if not I will do as you suggested and find them online. Thank you for sharing. Your holiday china is a must to have. I must check if I can get this in London. A 2 hrs flight from Stockholm & I work every now then at our London branch. TY for giving me this inspiration. 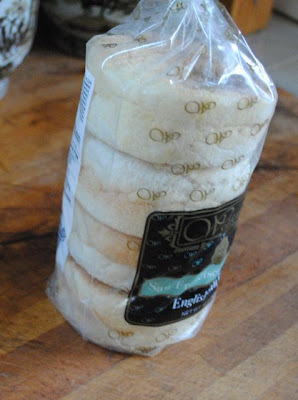 Is your English cookies crumpets? If so, I love to have that on breakfast just warm them up and spread the butter. Yummy... Now, am drooling. LOVE Wolfermans muffins!! My husband introduced me to their amazing store in Fairway. I was so sad when they closed. They made some chocolate cookies that were to die for! Oh no! I just came back from Costco! Yum, I love the nooks and crannies for the butter, too! Wonderful breakfast! Looks delicious! I'm feeling hungry right now! oh my! just yummy! you made me hungry! wish I could get the same muffin here! unfortunately I never see any here at my side of the world!. anyway, love the new teapot! have a good week! I really want one of those english muffnis now! Love your teapot!